The utmost care and the guarantee of safety are first and foremost at Beck Logistics. We therefore also comply with the most stringent relevant standards and guidelines. We are naturally accredited in accordance with the Safety Checklist for Contractors (VCA). Our drivers and crane operators possess the appropriate (in some cases, international) certificates, while their knowledge and skills are also regularly assessed. Furthermore, we are a member of the Dutch Association of Recognised Removers (AVVV) – which offers you assurances with regard to quality, storage and liability. 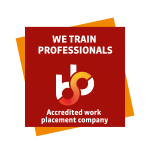 Qualified Learning Companies are indispensable. Here students get to know the practice and learn what is expected of them. Only Qualified Learning Companies may train these students. Beck Logistics is one of such Qualified Learning Company for transport and logistics oriented educations.We think this is an important part of our contribution to our social responsibility. On the one hand, we offer young people a chance to inflow, and on the other hand, this offers opportunities for growth for our permanent employees. It ensures the right balance in our staff and in this way Beck Logistics ensures herself constantly of the most up-to-date knowledge of the logistics market.